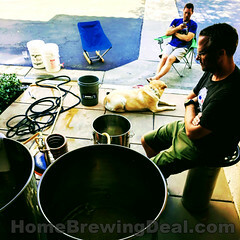 Start Home Brewing 5 Gallon Batches of Beer for just $99 with this MoreBeer.com Promo Code! 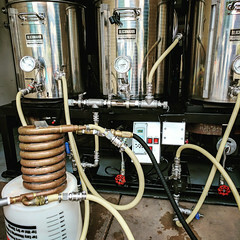 Coupon Description: Right now at MoreBeer, you can pick up their deluxe 5 gallon home beer making kit for just $99, that is a 25% savings off the normal price. This is their deluxe extract home beer brewing kit! You also get free shipping from More Beer with this order! 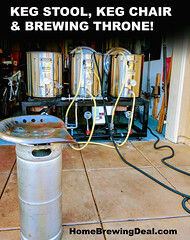 Coupon Description: If you have been wanting to try your hand at brewing your own beer but have not wanted to make a big investment in homebrewing gear, this is your chance. With this More Beer promo code, you can get a 1 gallon IPA homebrewing starter kit for just $44! This 1 Gallon IPA Home Brewing Starter Kit is about the easiest way to get started home beer brewing! This More Beer Home Brew Starter Kit allows you to craft beer right in your kitchen in just a few hours! This India Pale Ale features the clean bitterness of Magnum hops and healthy dose of the flavors and aromas of Cascade: arguably the hop behind the modern craft beer movement. Promotion Details: Buy a Home Beer Brewing Kit, Get Free Shipping And A Free $20 Gift Card at More Beer! Cyber Monday Homebrewing Sale Extended! Save up to 60% on popular home brewing items and homebrew beer kits! Get a Home Brewing Gift Card and save big at Homebrew Supply! Coupon Description: Homebrew Supply has a promotion going on that can earn you a freee homebrewing giftcard with every purchase of $50 or more. At homebrew supply you will receive a FREE gift card for $10 on orders over $50, $30 on orders over $150, and $60 on orders over $300! Click on the following link for more details on this limited time promo code for Homebrew Supply. Coupon Code Description: Right now More Beer has a coupon code that will save you 20% on their MoreBeer Holiday Ale Homebrewing Beer Recipe Kit and Their Thanksgiving Ale Home Brewing Beer Recipe Kit. Coupon Code Description: This MoreBeer promo code will save you $6 on a MoreBeer Holiday Ale Beer Beer Kit. This home brew kit makes 5 gallons of More Beer’s famous Holiday Ale. It is a malty red spiced ale for the season with included powdered ginger, cinnamon, and allspice. Not over done so it can be enjoyed without becoming ‘too much’. A very popular kit that we have been selling to rave reviews for over five years now. 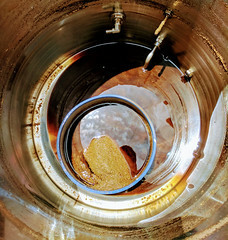 Includes 8lbs of malt extract, a blend of steeping malts including Special B and a hint of Roasted Barley, Northern Brewer hops for the bittering addition and Willamette hops for the flavoring addition. Here are some additional details on this holiday home brewing beer kit.